For over 100 years, these small spheres have been bringing peace and quiet to our hectic, noisy world, and have set an entire company in motion. 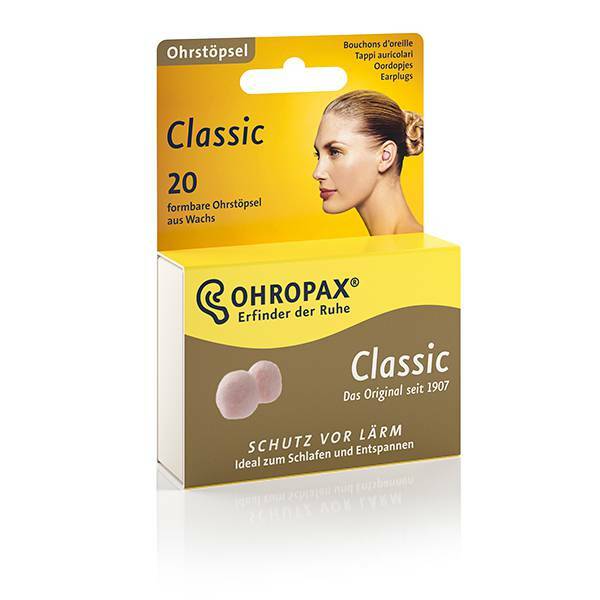 OHROPAX Classic has been our tried-and-tested noise protection product since 1907. The unique recipe – cotton wool soaked in a mixture of Vaseline and various paraffin waxes – was so successful from the very beginning that it remains almost unchanged to this day. OHROPAX’s success story began at the start of the 20th century in the bustling German capital of Berlin. In a place which, at the time, was synonymous with vibrant activity, ceaseless noise and the exciting onset of a new era. Here, the resourceful pharmacist Maximilian Negwer brought noise-absorbing wax plugs, the first product of its kind, to the market for everyone. Inspired by Homer’s famous depiction of the Greek hero Odysseus, who protected the ears of his crew from the deadly singing of the sirens with plugs made from beeswax, Negwer literally created a classic product in the form of OHROPAX, which has been offering the luxury of silence right up to the present day. 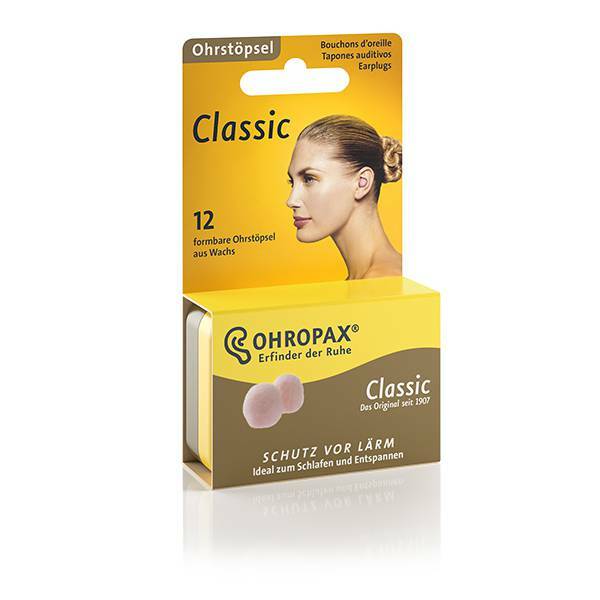 OHROPAX Classic is very comfortable to wear, making it the perfect way to get a restful night’s sleep without disturbances. It is also a convenient aid for general relaxation and for use during meditation exercises, reading and any work that requires concentration, DIY activities and loud music. Thanks to its tight seal, OHROPAX also offers protection against moisture and wind. The discrete and skin-coloured wax earplugs can be adapted to fit every ear and significantly reduce the effects of noise exposure. The soft, skin-friendly material fits securely into the ear, making the earplugs extremely comfortable to wear and ensuring there is no feeling of pressure. 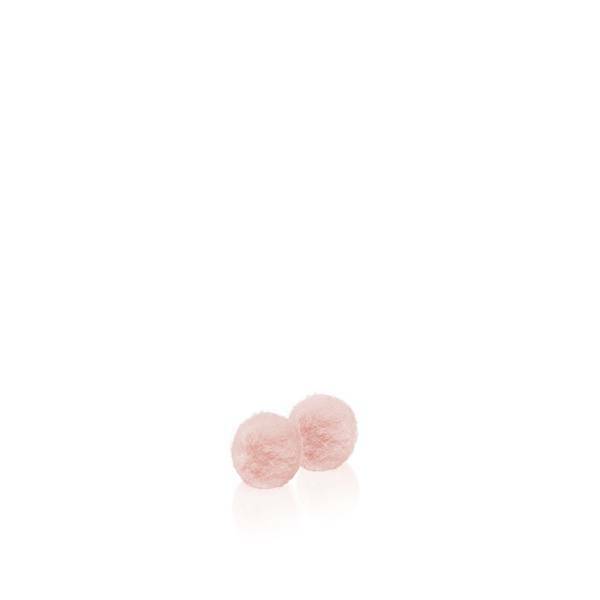 Before use, completely remove the cotton wool from the earplug using clean fingers. If necessary, tear off some pieces to make the earplugs a little smaller. Do not reuse torn pieces. Squeeze the earplug softly, shape into a sufficiently sized cohesive ball and seal the auditory canal tightly using a little gentle pressure. Do not insert deeply. After using, make sure to use your fingers to remove the earplugs. Apply some light pressure on the outer ear from behind to loosen the earplugs. Do not use hard or sharp objects to remove the earplugs.